Hello and welcome! 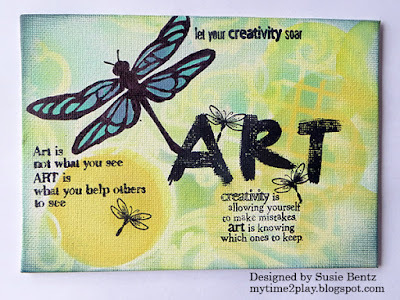 Susie here today sharing a canvas I created using PowderPuff Chalking Inks from Quick Quotes! 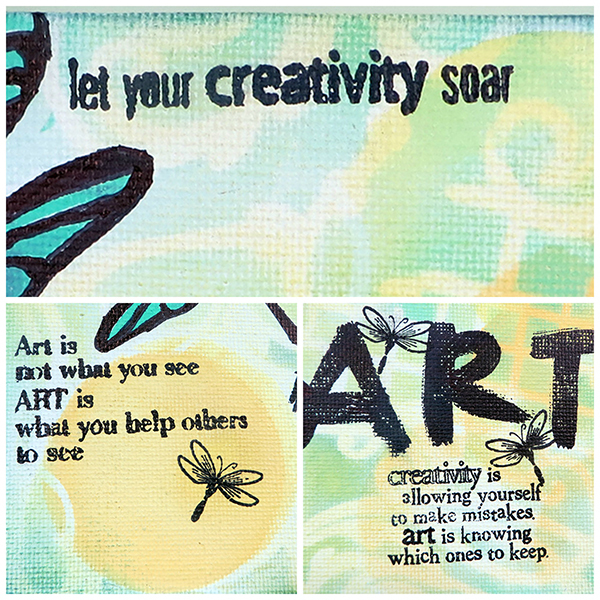 I started by using washi tape to adhere a stencil to a 5"x7" canvas panel. I lightly applied Seabrook PowderPuff Chalking Ink through the stencil. There was a circular design in the stencil that I had masked off. I applied Lemon Sorbet, then added Desert Sun on top of that. I continued to blend Desert Sun across the stencil, into the areas I had previously inked with Seabrook. I really like the greens it brought out! ...lightly inking with Desert Sun in a few places. I masked off the area around the dragonfly wings and applied Aqua, blending in just a touch of Brandywine in the center of the wings. I replaced the stencil and used a permanent black ink pen to trace the body of the dragonfly onto the canvas. I used a fine tip marker to color in the body and the wings. 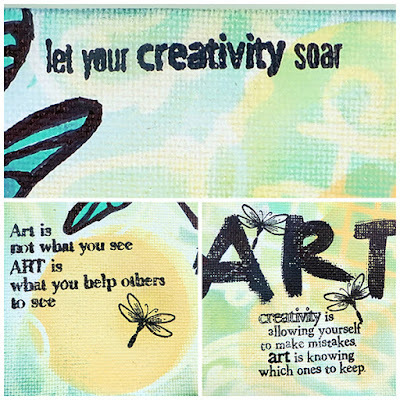 I used stamps from my stash and permanent black ink to add some inspirational quotes. I finished off the canvas by lightly brushing across the surface of the canvas with Desert Sun before inking all around the edge with Navy. Great canvas love the colors!